Our wetlands are one of the best safeguards against natural disasters. They help us cope with extreme weather events. They ensure communities are resilient and can bounce back from disasters. They provide millions of people with clean drinking water. This World Wetlands Day, we’re excited to share the premiere of our Wetland Wanderer video series! 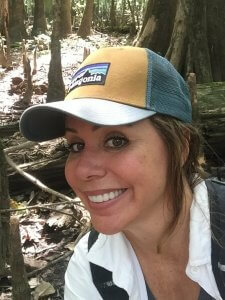 Our “Wetland Wanderer”, Lucia Ibarra, will explore wetland forests across the US South. The series will highlight the interconnection of wetland forest protection, climate change, and community justice. Watch Wetland Wanderer Episode #1 and explore the Robertson Millpond Preserve in Wake County, NC! Our wetlands are so incredibly important. By visiting, exploring, and understanding the many values of wetlands, we can help shine a spotlight on this incredibly misunderstood national treasure. Watch and share the video with all your friends! Protecting wetlands is an investment that will help us build a clean energy future that rewards communities for the clean water, flood control, recreation and more that their healthy wetlands provide. Stayed tuned for more from Lucia! She’ll be getting in touch soon to share her Wetland Wanderer Episode 2 with you! A life-long treehugger, Sam earned a Ph.D. in Environmental Science in 2015 at Wright State University and completed a postdoc at University of California Merced before leaving academia for greener forests. They are thrilled to be translating science into action with Dogwood Alliance. On the weekends, Sam enjoys hiking, home improvement, and gaming with friends and family.